The Milky Way candy bar from M&M/Mars is the rich milk chocolate, gooey caramel and nougat candy bar that everyone loves. One of the candy greats, the Milky Way candy bar sparked from a concept of putting chocolate malted milk into a candy bar. In 1926, the first Milky Way bars sold for a mere five cents each – by 2005, Americans alone ate more than 200 million of the chocolate covered nougat candy. If you are a fan of Milky Way bars, then you may notice the wiggly lines that appear on the bottom. These marks actually come from the belt that the candy bars ride on during the cooling phase. You may also notice the rich cocoa and malt taste that Milky Way candy bars deliver. These are the flavors added to the frappe to create the signature Milky Way candy nougat flavor. 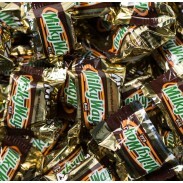 Sweet City Candy offers Milky Way bars, available now in boxes of 36 individually wrapped candy bars. Order today and stock the shelves of your retail or candy store for the low Sweet City Candy wholesale price. Sweet City Candy is your wholesale candy headquarters. 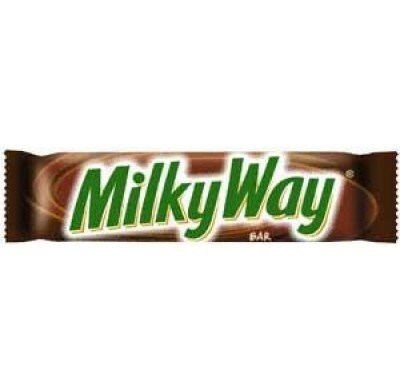 Enjoy Milky Way bars delivered fast, right to your door at low wholesale prices.